Gritty works the crowd during Flyers’ 8-2 loss in their home opener on Oct. 9. Gritty fought actor Ricky Gervais on Jimmy Fallon, became a political symbol on protest signs, scored a beer named after him, started a bromance with the Phillie Phanatic, got roasted by Colin Jost on Saturday Night Live, worked at the soda window at Pat's King of Steaks with Guillermo Rodriguez from Jimmy Kimmel Live!, and has been the star of many memes. All of this has come in about three weeks. The buzz around Gritty so far — the good, the bad, and the weird — has provided "tremendous" marketing, said John Lord, professor emeritus of sports marketing at St. Joseph's University. "He looks like a Muppet on steroids," Lord said. "Your immediate reaction to this character was awful." But "the Flyers now are much more visible in the national marketplace than they otherwise would've been." In many ways, Gritty seems made to be a meme. Images and videos have spread virally, with sharers using Gritty to explain everyday emotions. Gritty's appearance and persona have set him apart from other mascots, said Americus Reed, a marketing professor at the Wharton School of the University of Pennsylvania. "How do you do that? You invest in that character," Reed said, "in a way that a Hollywood screenwriter or a stand-up comedian might." It's hard for companies to develop a brand on Twitter, but companies like Wendy's have done it well, Reed said. Gritty's official Twitter account already has attracted 134,000 followers. After decades without a mascot, the Flyers started thinking about creating one while watching a hockey game played by mascots at an NHL All-Star Game a couple of seasons ago, Flyers vice president of marketing Joe Heller recently told Delaware Online. They had a blank canvas and hired Brian Allen of FlyLand Designs, near State College, to create the image. Allen started with 20 sketches, he wrote on his website, including dragons, a flying squirrel, yetis, and groundhogs. "They picked a big dumpy monster I had drawn as the starting point," Allen wrote. "After several iterations, including different wing styles and facial expressions, we landed on their new mascot." Character Translations in Norristown created the costume in about two months, Delaware Online reported. "The decision to give him googly eyes and the ability to blow smoke out of his ears were all decisions we had to make on the fly as a group," Heller told Delaware Online. "Maybe the eyes didn't photograph so well early on, but now they give Gritty a lot of character." Brian Allen’s Gritty sketch during the design process. Brian Allen’s design of Gritty. David Raymond, the original performer inside the Phillie Phanatic, helped as a consultant to create Gritty. He anticipated critical reactions to the furry orange "lovable monster." "Part of being a fan is to announce your feelings," said Raymond, whose firm, Raymond Entertainment, is based in West Grove. "It just comes with the territory." But he did not predict the Flyers would get so much attention. Raymond tells his clients there are four basic components to a mascot's success: The group must be committed to the project, there needs to be a story behind the character, the design should be unique and identifiable, and the rollout has to include a distinct personality and the right performer inside the costume. "Who are the Flyers?" Raymond said they asked themselves during Gritty's conception, and the design team recalled the team's "Broad Street Bullies" nickname of the early 1970s. Gritty's story, as it has been shared so far, includes a personality shaped by having a father who was a bully. Gritty was forced out of hiding by construction. He's known to eat snow from the Zamboni and loves hot dogs. "You can't hug an institution," Raymond said. "You can't hug the players, in most cases … but you can hug the mascot. It is the living, breathing brand extension" of your brand that helps fans connect. Some fans at the Flyers' home opener already owned Gritty-themed gear, and those who didn't could buy Gritty shirts inside the Wells Fargo Center, Inquirer and Daily News reporter Stephanie Farr reported. A fan wearing a Gritty shirt, Tim Wynn, 38 of Northeast Philly, told Farr he "didn't understand what he was, but now I get it. He's a crazy Flyers fan." Amanda Dougherty, 29, of Boothwyn, who is pregnant, wore a "future GRITTY fan" shirt and said she didn't fall in love with Gritty until "day two." "He's every dude from Delco," she said. Now that Gritty has made his national debut, the question is how a character who looks "a little bit disturbing" endures, said Mike Lewis, a professor of marketing at Emory University outside Atlanta. Most mascots provide "comic entertainment." In other sectors, like insurance, mascots can boost a brand's recognition and persuade a consumer to buy a product. "In the corporate world, you're fighting for territory in a consumer's mind, and that territory is limited, Wharton's Reed said. "So if you're Geico that little Gecko character, you're fighting with Flo over at Progressive" insurance. In sports, "the mascot's role is to be more of 'here's my brand' and it's a fun thing and a direct source of entertainment at the event." When Gritty made his on-ice debut, he slipped and fell, and the internet mocked him. But he joined in and tweeted: "Why didn't anybody tell me the ice is this slippery?" 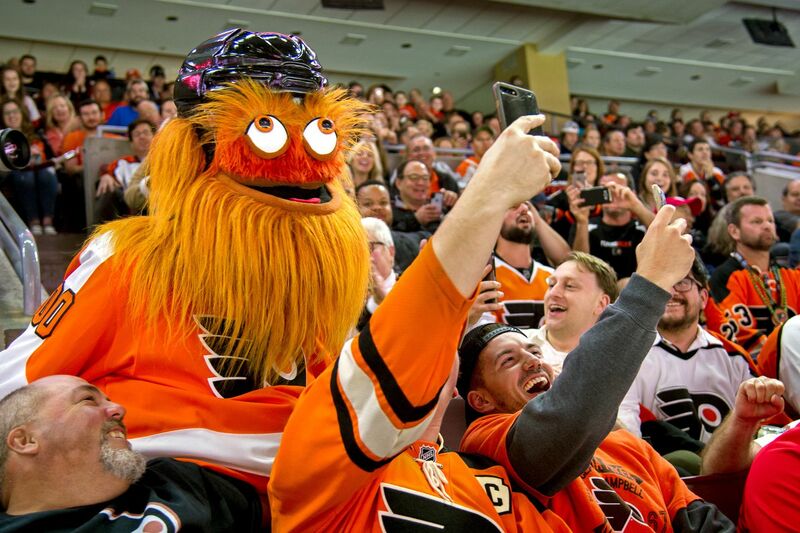 Though Gritty has been able to drive conversations in social media since his debut, Reed said it is too early to tell if Gritty will be a long-standing success. Still, his presence so far shows a "really good understanding of the consistency of the brand of the city, and brand of the Flyers, and the brand of the character," Reed said. "That's why it's going to come across as authentic," Reed said. "Even the name is smart. That's exactly what Philly thinks it is: This gritty, blue-collar city."